The world of foreign embassies seems like it's quite a glamorous one, full of glittering balls, fancy dinners and interesting people. Of course, it's probably not like that at all. In fact, it's probably a lot of thankless hard work, but then that wouldn't make a good YA novel now, would it? Luckily, Ally Carter has chosen to focus on the glam side of embassy life in All Fall Down, the first book in a new series. 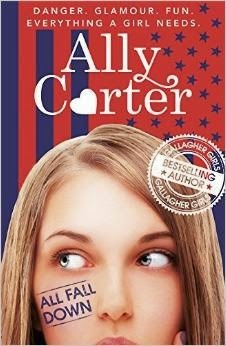 Grace has moved in with her grandfather, the American ambassador to (the fictional) Adrian, three years after her mother died in a fire. Only Grace is sure that her mother was shot by a man with a scar on his face, and she's determined to find the culprit, even if everyone else thinks she's a troublemaker. All Fall Down has great characters in Grace, who is determined to get to the bottom of the mystery of her mother's death, while also trying to come to terms with her grief; the funny and sweet Noah, who has hidden depths; Rosie, who takes on the role of little sister, but who is so, so smart; the initially silly Megan who has the brains to more than match her beauty; and Alexei, the handsome Russian guy next door. But what makes All Fall Down such good reading is the way it's a combination of coming of age story, novel about friendship, and a mystery. Carter is good at bringing together the various different genres, creating a story that has many layers, and that is alternately funny, sad and full of suspense, and that is very clever, and darker than you expect. And she's good at not going down typical teen novel routes - yes, Alexei is all kinds of appealing, but romance is not at the forefront of this novel, in fact, it's barely in the background. It's refreshing, because romantic storylines are often shoehorned in regardless of how many other much more serious things are going on. Carter doesn't do that, and I loved it. All Fall Down is a fun read - a bit like Gossip Girl meets Political Animals by way of Revenge (sort of), just for teenagers and on the page rather than the screen. And the ending, which I can't even hint at, makes me really look forward to the next book in the series.